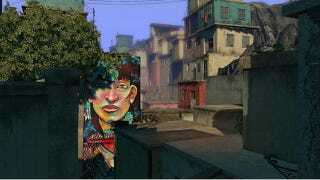 Graffiti's played an important part in video games since early days, especially on console. Who can forget Jet Grind Radio's neon-colored spray paint? And, of course, Marc Ecko's Getting Up centered its entire essence on the politics around graf writing. Sebastian Navarro (AKA Charquipunk), Simon Paulo Arancibia Gutierrez (AKA La Robot de Madera) and Inti Castro (AKA INTI) are the three celebrity graffiti artists lending their work to Papo & Yo. Charquipunk is known for his intricately detailed large-scale designs of cats and birds, while La Robot de Madera focuses on elaborate portraits. INTI is known for his work with kusillo, the Altiplano carnival clown whose costumes consist of clothing scraps. When they collaborate, which is often, each artist's style is still distinct, but their synergy is electric. It seems like there's not going be any kind of game mechanics attached to the artists' work. I like that the trio's contributions are there to add eye-popping touchstones to the real world in the a surrealist game. Papo & Yo will be one hell of a visual feast when it comes out in two weeks.